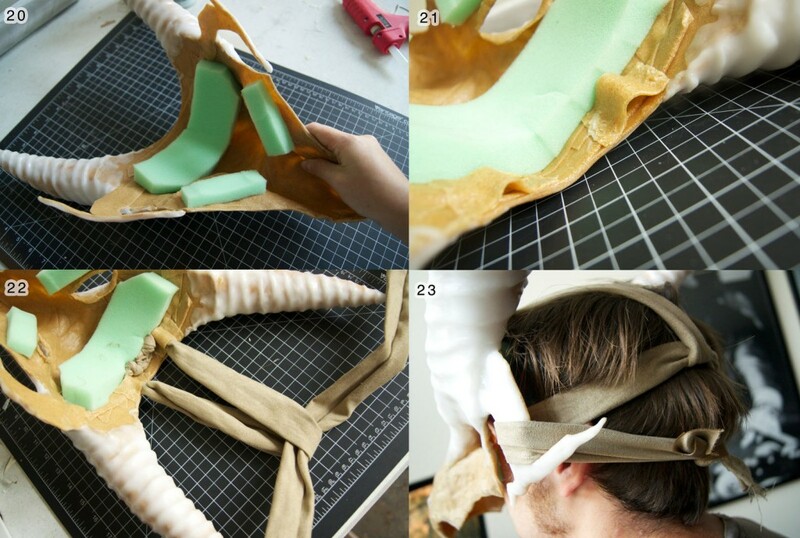 The lovely Termina Cosplay shared this tutorial on the making of a Marowak Mask, done entirely from friendly plastic and scraps. Mask making with Worbla and Friendly Plastic! The Worbla I used to make my mask was 100% scrap. 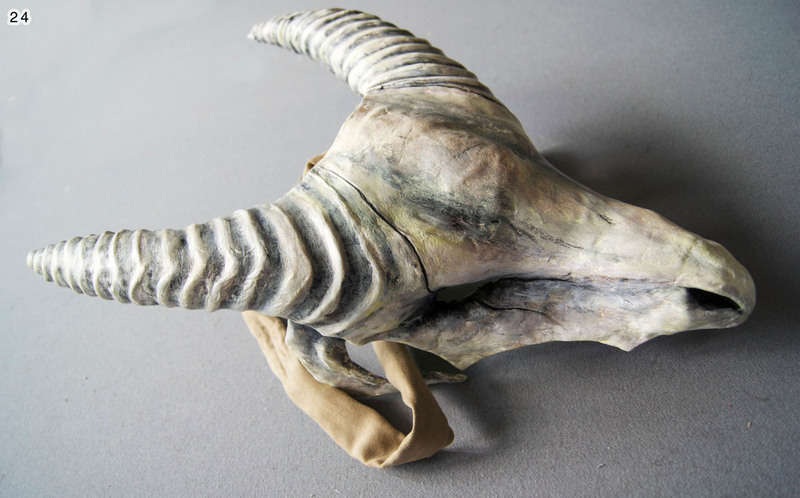 The same method can be used with any kind of mask, but my Marowak skull mask will be my example. These are all the materials I needed for my mask. You may not need everything that I used. Start with your mask form and cover it with plastic wrap Use a couple of layers to be safe. The plastic wrap will keep the Worbla from getting stuck to your mold, and make it much easier to pull off later. 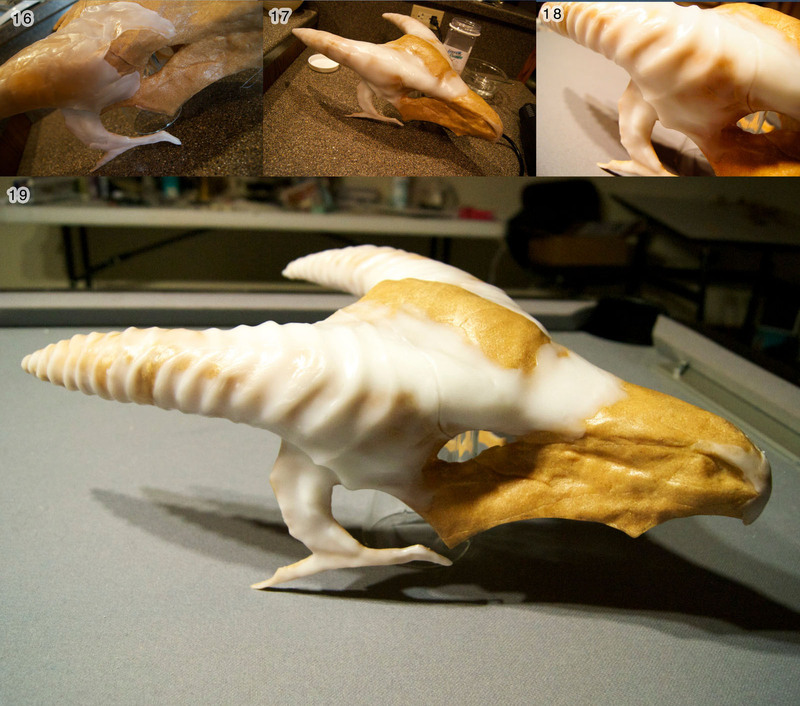 I made my form from scratch with wire mesh and clay, but you can use an existing form as well. 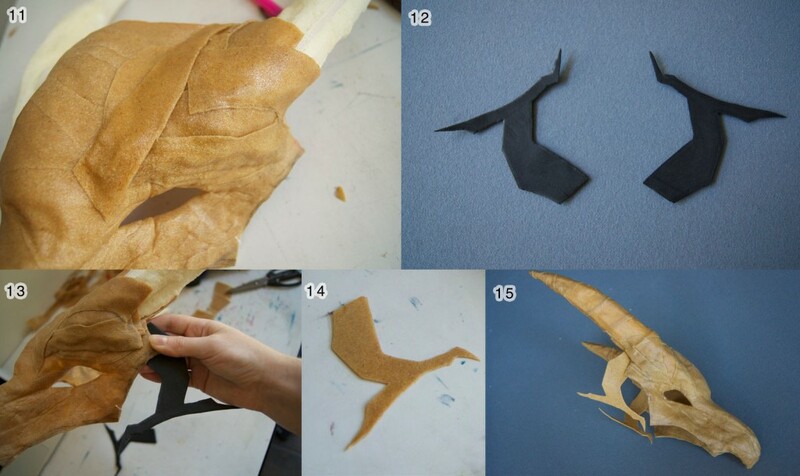 Once your form is covered, start adding your Worbla. I used nothing but scrap for mine, but you can also use a full piece. If you are using scraps, lay the pieces over your form, overlapping them slightly and press them down as you go. Do this until you have a few layers worth of scraps on your mold. Don’t worry if your scraps go over the edge of the mold, you will trim that up later. If you are using full pieces rather than scraps, just make sure you are covering the entire mold, and use at least 2 or 3 layers. Make sure not to apply heat directly to your mold while the plastic wrap is still visible, the heat will rip holes in it, and you don’t want that. Next, you will need to smooth out any seams you might have, and if you’re using scraps, its going to be a lot. Take your heat gun and apply heat directly to the mask (the plastic wrap will be safe under the Worbla now). Don’t be afraid to get it really hot, even if it starts to bubble a little bit, thats ok. It will actually make it easier it smooth out that way, but whatever you do DO NOT TOUCH THE BUBBLY WORBLA WITH YOUR ACTUAL HANDS. It can burn you if you are not careful. Instead, take a spoon and some water, dip your spoon in the water, and smush all the seams flat with the watery spoon. You’ll have to get the Worlba really hot and smush really hard if you want to get rid of the seams completely, but since my mask was supposed to resemble bone, having a few lines left over wasn’t going to hurt. You can also use clay tools to help you get the Worbla to shape to the form properly (like if you have cracks or crevices you need to Worbla to get into). This is what my mask looked like after flattening the seams. You can still see where they were in most places, but it was very smooth to the touch. The next step is de-molding your mask. If you used enough plastic wrap, you should be able to pop the mask right off. As you can see, the inside is pretty ugly, but since no one will actually see the inside of your mask as long as you have it on, its not a big deal. Use this time to also trim up the inside of the eye holes. Next, trip up the edges of your mask into the right shape. Also use this time to try it on and see if it actually fits your face. You can still heat up your mask and reshape it if you need to, just be careful and use a lower heat setting so you don’t accidentally cave it in. Next, I positioned the horns on the mask and hot glued them on. Then, I covered the foam board with expanding foam. The brand I used is called “Great Stuff” and you can buy it at any hardware store. Make sure you are working on a surface that can get messy and stay messy. Expanding foam does not like to come off of anything it gets stuck to. This is what my horns looked like after the foam was completely cured. It normally takes a few hours to cure, but you can speed up the process by spraying it with some water. To test it, stick a knife into it. if it comes out clean, its done! Once it was completely cured, I carved the shape of the horn with a craft knife. Next, it was time for me to cover the horns with Worbla. I used smaller pieces of scraps for this, and built up around the base to give it a more smooth transition. I did not smooth out the seams at this point. If I were to try to smooth the horns as I did with the rest of the mask, it wouldn’t work. The foam I used for the horns is too soft, so doing so would just crush them. I will explain how I smoothed them later. I needed to add on a small detail at the sides of my mask (sort of like a jaw bone), so I cut the shape out of craft foam. I then tested it to see if it would fit right on my mask. Once I was satisfied, I doubled up a couple layers of Worbla, and used my craft foam piece as a pattern to cut out the shape. Then, I heated up both the sides of the mask and my new Worbla piece and added them on and shaped them into place. At this point, It was time for me to switch over to Friendly Plastic. If you are not familiar with it, Friendly Plastic is also a thermoplastic (like Worbla) but it comes in pellets rather than sheets. It is much easier to sculpt with than Worbla, and it is perfectly smooth when you’re done. The only downside is that it cools down much faster, and so you have to work fast or keep heating it back up. To heat Friendly Plastic, I use a bowl of hot water. I boil the water in a tea kettle, pour it into a bowl, and then pour in some Friendly Plastic pellets. Once they are all gooey, I scoop them out with a spoon. During this step, I took globs of Friendly Plastic and applied them to my mask to build up the places that still needed some shape, like the jaw bone piece and around the eye holes. To shape it, I used my heat gun to reheat the plastic once it was on my mask and I used a combination of my fingers and a spoon dipped in water to smooth it (you need the water to keep the plastic from sticking to your spoon). With enough heat and pressure, you can make a perfectly smooth transition between the Worbla and Friendly Plastic. Here is my mask after being built up with Friendly Plastic. As you can see here, I covered both the horns with it, which is why I didn’t have to worry about smoothing them out before. Everything white is Friendly Plastic, and everything brown is Worbla. Once my mask was covered with enough Friendly Plastic, I added on all the extra details. I just heated it with my heat gun and sculpted them on. I added some cracks around the eye holes and the ribs on the horns. Now, after all your detailing and sculpting is done, its time to make your mask wearable. I needed to add some cushioning to the inside so it would sit up right. This also helped to make the mask more comfortable. Just put the mask on your face, and decide where any cushioning might need to go to make it sit where you want it to. The cushioning I used was regular cushion foam you can buy at any fabric store. I added some on the forehead and under the eyes. To attach, I used hot glue. Next is to devise a way to attach the thing to your face. I took some more Worbla scraps, made some little loops, and pressed them onto the inside of the mask at the top. Then I strung a strip of fabric through them and tied off the edges so they wouldn’t pull back through. I then strung another strip of fabric through the first, and wrapped it through my jaw bone pieces. You can use a number of different things (leather straps, elastic, etc. ), but fabric worked well for mine. This is how my fabric contraption works. You can see the fabric runs over the top of the head, wraps through the jaw bones, and the ties off at the bottom. My mask ended up being a bit heavy, so the extra support was required. You might have to get creative with your attachments, depending on the complexity of your mask, but if your mask is light and simple enough, some elastic will do the trick. The last step is to prime, paint and decorate your mask however you want! Wood glue makes an excellent primer for Worbla and Friendly Plastic and can easily be sanded to make your finished piece extra smooth. Once you are satisfied with your paint job, seal your mask with a spray sealant to protect it. Since my mask was supposed to resemble bone, I used a matte finish, but you can use whatever kind of finish suits your project. Thanks again to Termina Cosplay for sharing this with us!